Each time the Democrats do something shameful, and despicable I wonder to myself if they can possible stoop lower? 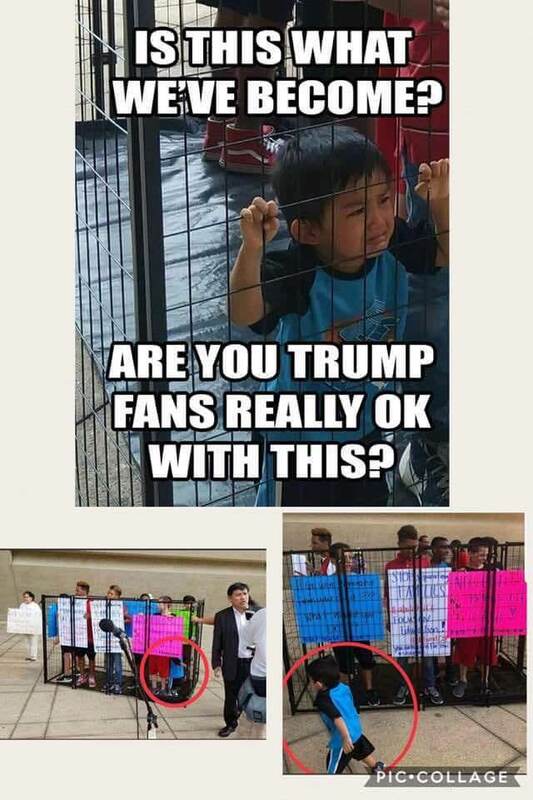 Each time they answer my internal question with a resounding “YES THEY CAN!” The Dems fake outrage over child separation is being made political for several purposes. First, they want to incite anger and create Trump as a racist. They also want to distract the American people from the IG report that clearly displays the FBI’s bias against Trump and turning a blind eye against the Clinton’s criminal wrongdoings. Dems Fake Outrage Meant to Portray Donald Trump as a racist when all he is doing is enforcing a law enacted in 1997. We are in a border crisis, and the future of America lies in the balance. As illegal immigrants pour into the country with hopes of complete amnesty, the demographic change is encouraged by Dems (in the name of tolerance). There is a lot to go over, so lets break this down into segments. Shown below is a photo of a crying child that you may have seen all over the internet. The Dems shared this picture wildly, until it was discovered that it was a fake publicity stunt. As you can see from the photo above, the entire setup was staged. This is not to say that children are not being separated. They are, but Trump doesn’t have a choice in the matter. They are temporarily separated while the parents (or human traffickers) are being processed. We are a Nation of laws and borders that need protecting. Without laws we become as lawless as Mexico. We have LEGAL points of entry where immigrants should go if they want to seek asylum. “The way the system works right now the threshold under law is so low that about 80 percent pass that initial interview, but only 20 percent are granted asylum by a judge, which tells us that 80 percent of that is either just a flat-out fraud or somebody who thinks they can come here because they want a job here. That’s not asylum. Or ‘I want to reunify with my family.’ That’s not asylum. ‘I just want to come to the United States’ — not asylum. We have legal ways to do that, but it’s not through asylum,” Nielsen told Fox News host Laura Ingraham. Donald Trump and the vast majority of his loyal supporters believe that border enforcement should be… well enforced. There is a legal way to gain entry into the United States. This has not changed under Trump. Over 1 million immigrants are allowed entry into the United States each year. These are stats from the Department of Homeland Security. Just how generous are we on immigration? The United States (by a wide margin) has more immigrants than ANY other country in the world! 46.6 million (approximately) immigrants live in the United States that weren’t born here. The U.S. – Mexico corridor is the worlds largest. Nearly 1 in 4 (26%) immigrants living in the U.S. are from Mexico. As you can see there is a lawful way to enter the United States legally. There is a process that law abiding future citizens should follow to gain permanent entry into the United States. By crossing the border illegally, they are in fact committing a crime and violating border laws. To politicize this in an attempt to incite anger and outrage towards President Trump is outright wrong! Without even thinking about the consequences of their actions, democrats encourage immigrants to flood the border. They literally have immigration lawyers waiting for them to help aid them along the way to game the system and exploit loopholes. The democrats do not have any compassion towards immigrants, migrants, refugees, etc… They have one common goal and that is to get more minorities into the country until they can convert them into democrat voters. They simply can’t win on the merit of their policies. Socialism can (and will) ruin a country very quickly. Just check out a past article we wrote at Rinoswamp about how Socialism has ruined Venezuela with mothers, teachers, and doctors resorting to prostitution to feed their kids. Children are being human trafficked into America. Children without an accompanying parent. In many cases, the adult with the children are strangers and merely posing as their parents. This is very dangerous to the children. If the democrats cared they would not encourage human trafficking of helpless children. The United States has laws, and we are a nation of laws. Democrats are politicizing Donald Trump enforcing laws that will help to keep America safer. The Dems have no concern about the safety of you or your children. In fact, they are putting the lives of your family in jeopardy by encouraging undocumented illegal immigrants from Central America to migrate into America. Democrats are the party of bigotry, identity politics, and fake outrage to create divide among Americans. This is not what America is about, and nor should it be. America is the greatest country in the world because we have prosperity, driven by the laws that we enforce. A lawless country can’t thrive, and innovation can never flourish in a country without laws and protections for their citizens. Presidential Alerts, Funny Meme Suggestions, Can You Turn It Off?